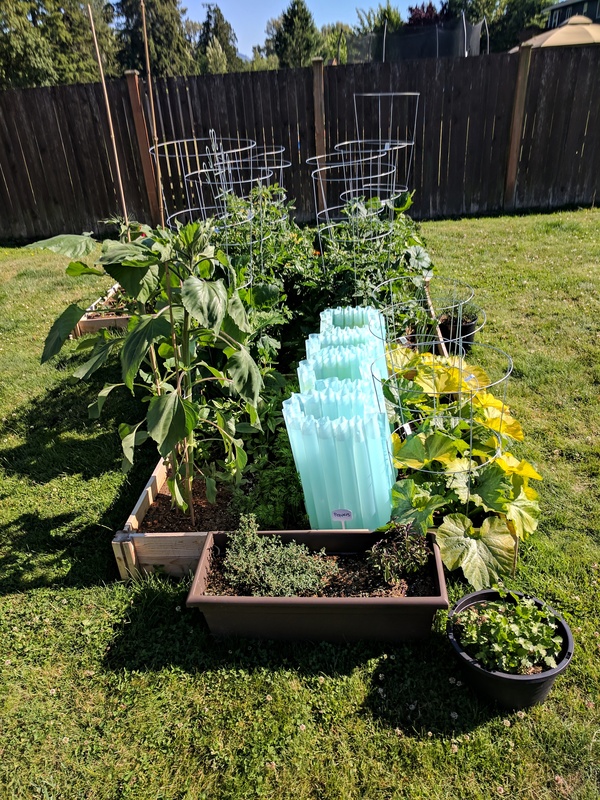 I can’t believe how much this garden has grown since I put it in on May 8th. Just a little over a month ago and it looks like a jungle. We definitely do not have enough room for everything now that it is exploding. I honestly didn’t think it would do this well. I’m not known for my green thumb. That would be my sister and brother-in-law. We have had to pull out some lettuce to thin it out a bit for other stuff to grow. We harvested a bunch of kale already and it looks like more leaves need to be harvested. I took a bunch to work because there was no way we were going to be able to eat it all. I ended up pulling out my purple cauliflower, there just wasn’t room for it and everything else. It was sad but I hadn’t expected it to do anything anyway, I bought it to help a local charity called Growing Veterans. It’s where I bought the kale as well. They had some superb plants for sale. I’ll definitely be hitting them up again next year. The tomatoes have tons of flowers but I’m not seeing any fruit develop yet. We may have to do some manual pollination soon. The cucumber I thought wouldn’t make it is looking healthy and growing like crazy. We even have some baby cucumbers! It’s not going to take long and we’ll be able to harvest those and have a fresh salad from our garden. The sunflowers are getting huge. I’ve already had to stake them but I can see I’m going to have to double up on the stakes and give it a bit more support. I also took the herbs from our upper deck and put them by the garden. They just weren’t getting enough sun and since then they have been doing much better. So now I know. This has been a great learning experience so far and we are definitely making notes on what to do and not do next year.